his hair style is really nice!!! agreed; awful coat! Looks like bathroom fur! I agree, but his hair and eyes make me forget of the ugly jacket! He was confused by his own cuteness and thought he actually is a teddy-bear?! ahhh so I just want to cuddle him. I also want his shirt. Oh dear, the Yeti costume again! Please God, let London have some warm sunny days and make this fake-furry horror stop! He reminds me to somebody… I love his intense way of staring at the camera. Me 2! Very attractive guy, interesting fashion. Attractive man. Love his shirt and the way he is staring at the camera. Audacity. Nothing here is “awful”, just off, which is on from the perspective of another. Am I the only one that loves the coat? Mm mmmmm. He looks gooood. I agree, the texture makes the entire look. I higher quality jacket would have made the look stale or too manicure and soft. ESA MIRADA… Y LA GREÑA… MMMMMH! It’s the hair that does it here. The flyaways balance perfectly! I like how he looks like. Great photo, I love his look! I’m starting to think that matching hair and top textures is a winning idea. Shirt. Coat. Hair. The Look. All is perfect! He looks so interesting..LOVE this photo!! 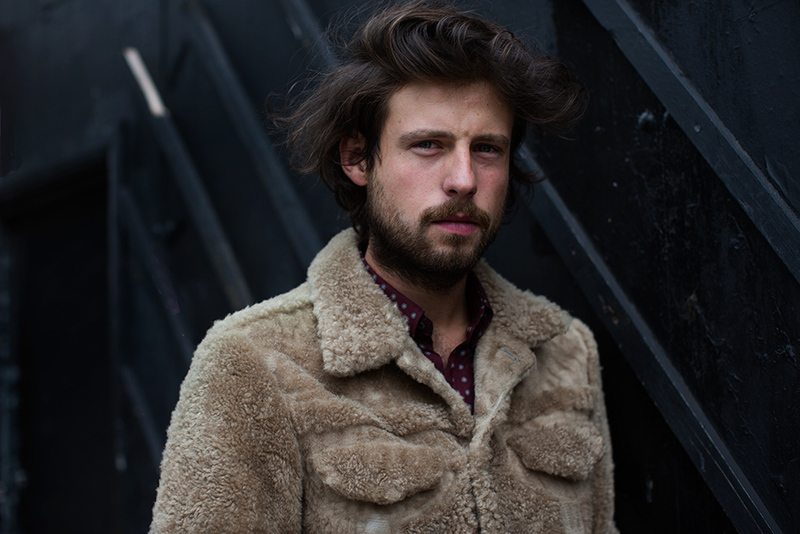 London men’s texture and coat grooming? Bed hair at its best ! Wow homeless chic…if there is such a thing…sorry the jacket looks like a teddy bear tossed away..
Great shot and I love the guy’s hair! Love the untidy hair, and the coat is so original, especially with the dots shirt underneath! i bet he has an amazing sense of humor!!! Such a nice potret! Amazing. It looks like his eyes tell a story. Looks like an urban mountain man! Don’t know how I feel about his jacket looking like a carpet but, wow, he’s handsome! And overall, a fantastic shot! Three words: Cuddle. Hug. Snuggle. Woah, he’s gorgeous! Reminds me a little of a young Hugh Grant. I shouldn’t like that coat and if most of the guys in Seattle wore this, they’d look ridiculous, but he’s really pulling it off to the point where I actually kind of love it. Looks like Margiela fur coat…. still cold in London? Said it before, but I love any picture of a man with a beard. Love the coat too though! What a shot, love this! Is the dude from that band British Sea Power? Great head of hair and beard..